The monotheistic religions of Judaism, Christianity, and Islam have severely limited the portrayal of the divine as feminine. But in Hinduism "God" very often means "Goddess." This extraordinary collection explores twelve different Hindu goddesses, all of whom are in some way related to Devi, the Great Goddess. They range from the liquid goddess-energy of the River Ganges to the possessing, entrancing heat of Bhagavati and Seranvali. They are local, like Vindhyavasini, and global, like Kali; ancient, like Saranyu, and modern, like "Mother India." The collection combines analysis of texts with intensive fieldwork, allowing the reader to see how goddesses are worshiped in everyday life. In these compelling essays, the divine feminine in Hinduism is revealed as never before—fascinating, contradictory, powerful. John S. Hawley is Professor of Religion at Barnard College and Director of the the National Resource Center for South Asia at Columbia University. Donna M. Wulff is Professor of Religion at Brown University. 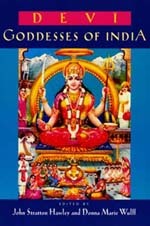 Together they edited The Divine Consort: Radha and the Goddesses of India (1986).